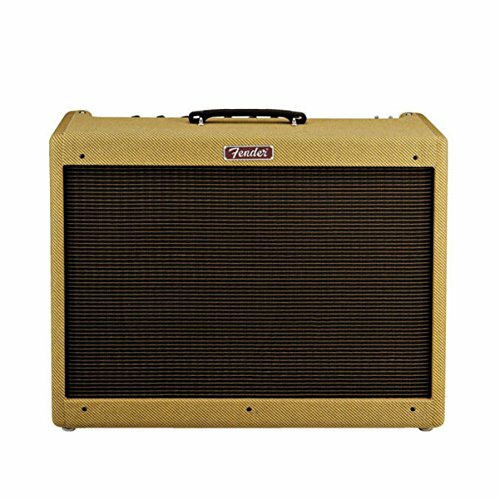 The reissue Blues Deluxe is a vintage-style tube amp with boutique tone at a great price that many pro rock, country and blues players have used to superb effect. While its newer cousin, the Hot Rod Deluxe, has many modern refinements, more and more enthusiasts continue to request the warm tone, unique circuitry, classic features and sharp look of the original version. It pumps 40 watts into a single 12" Special Design Eminence speaker fueled by two 6L6 Groove Tubes output tubes and three 12AX7 preamp tubes. Its two channels (normal with bright switch, and drive) are voiced for classic blues, country and rock; other features include Fender spring reverb, effects loop, two-button channel footswitch, tweed covering, chicken head knobs and chrome control panel. 40 watts of legendary Fender tone. Fantastic clean and overdriven tones plus lusciously Fender spring reverb. 1X 12" Eminence special-design speaker offers enhanced midrange that fills the stage and projects through the densest mix.